Energy Absorption: Parasite is able to absorb the life energy of other beings leaving withered corpses. Parasite is also able to absorb virtually any other energy form and use it. 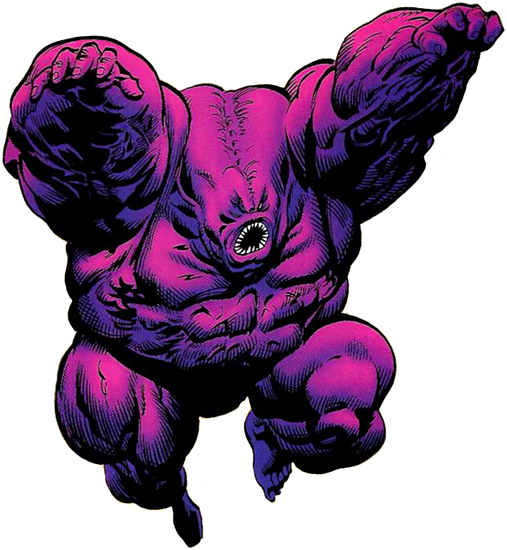 Enhanced Abilities: Parasite gains enhanced strength, agility and endurance by absorbing the energy of other beings. Shape Changing: After contact with the Strange Visitor Parasite’s powers changed enabling him to keep the energy he took longer. Somewhere he and his scientist counterpart gained new powers by absorbing a shape-shifter as well. Now not only does he sap the life energy out of his victims he can actually become his victims right down to their DNA. Originally a menial slacker, Rudy Jones was transformed while working as a janitorial labourer at a Pittsburgh's S.T.A.R. Labs facility. Thinking a waste container might have held something valuable he opened it and was exposed to strange radiation that changed his body. Jones now had the ability to absorb the life energy of other people leaving withered corpses. Eventually a scientist that was tending Rudy was tricked and ultimately absorbed into the Parasite. This joining was different than Rudy's others; he actually retained the scientist, Dr. Torval Freeman, as a part of his own mind.